For information about Lord's Point in the present day, visit the Lord's Point Association web page. I was pleased to see that Lord's Point also has a Wikipedia entry. The "1935 View" above is from the Connecticut State Library, which is a wonderful repository of information. I've begun to use it to track some of the (very) old roads in the area, which left faint traces still visible then, but not now. It's well worth exploring. 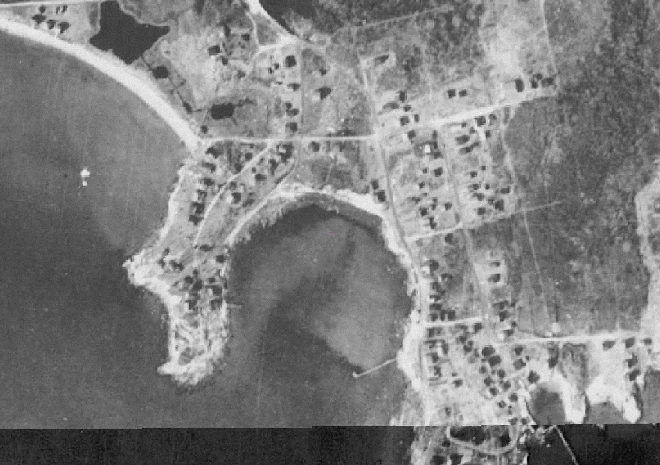 There was also an effort to document the damage of the 1938 hurricane from air, here. Another site allows you to compare 1934/35 imagery with that of today: http://magic.lib.uconn.edu/mash_up/1934.html. Be sure to scroll around a bit. The underlying geology is explained a bit in the main QB web page. A quick reference is the Mystic Quadrangle of the Bedrock Geological Map of Connecticut, which shows the underlying types of stone. This map is dated June 30, 1908. The title, in the lower-right-hand corner, reads "Plot of Lords Point, Stonington, Conn., Owned by James E. Lord, Fannie Noyes Lord, and Others. 1 in = 100 ft. Geo. W. Perry C.E. Putnam, Conn., June 30, 1909". The map, looks like a planning map rather than a reflection of 'facts on the ground' - for example, "East Railroad Street" never came to be, and the triangular "Playground" adjacent to Lindberg Rd. (here listed as "West Railroad Street") is mostly underwater - maybe the intention was to fill it. 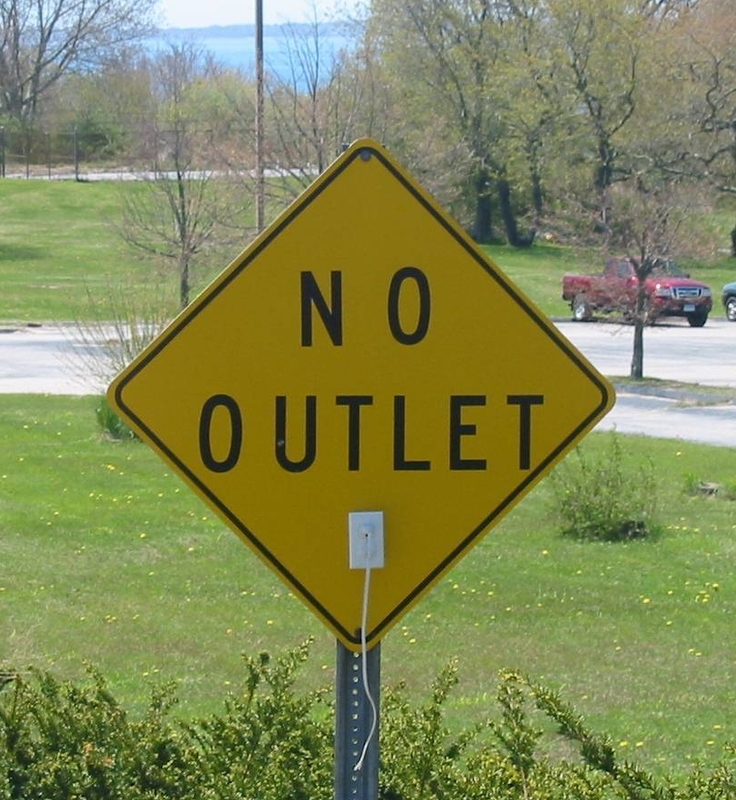 Someone else added the plug/cord; and since its original installation it has fallen off several times, and some kind soul (or souls) have put it back. I'm pleased to see that it is still there, and I'd very much like to thank those that have helped keep it there. If I were to do this as a green sign as above, I'd probably aim for a different aspect ratio, one more vertical than horizontal. My original plan was to create a horizontal, one-line sign that would fit under the Lord's Point sign, so I began thinking in horizontal terms, but it could well work as a standalone green "highway" sign somewhere along Noyes Ave. Or, as with many such ideas, maybe it's just more fun to contemplate. There is little information on the early history of Lord's Point; I'm looking into land records, etc. to try to determine how the land might have been used. 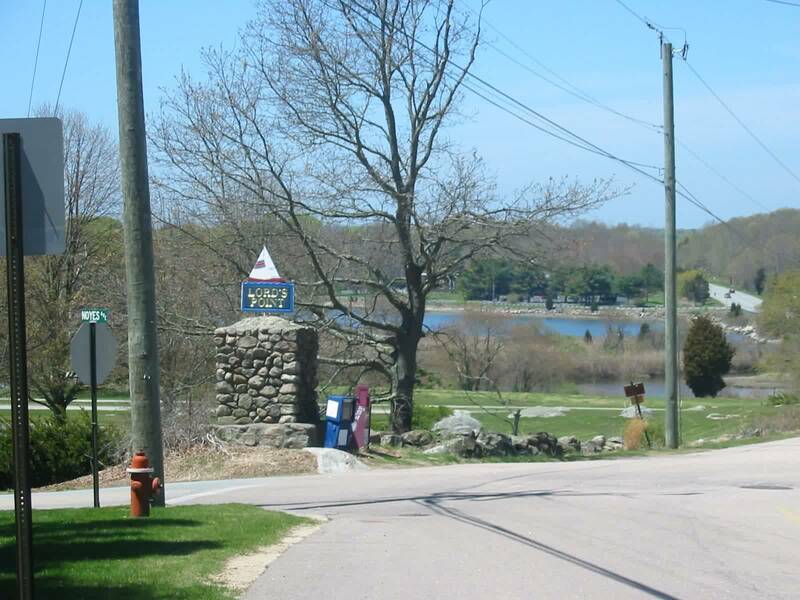 One of the early cemeteries in town is that of the Hallam family; the cemetery is on Wamphassuc, just north of the railroad tracks, at the edge of the harbor. The main QB page discusses John Hallam, who lived nearby and who was on very good terms with Captain Kidd. I have not been able to find any reference to what the area of Lord's Point itself was called by the indians; perhaps "Wamphassuc" covered the entire area. That word meant "white land", or land frequented by white birds. This same term was used for the Dumplings. It may have referred to the coloration left on the rocks by many birds, for the same reason White Rock is named. 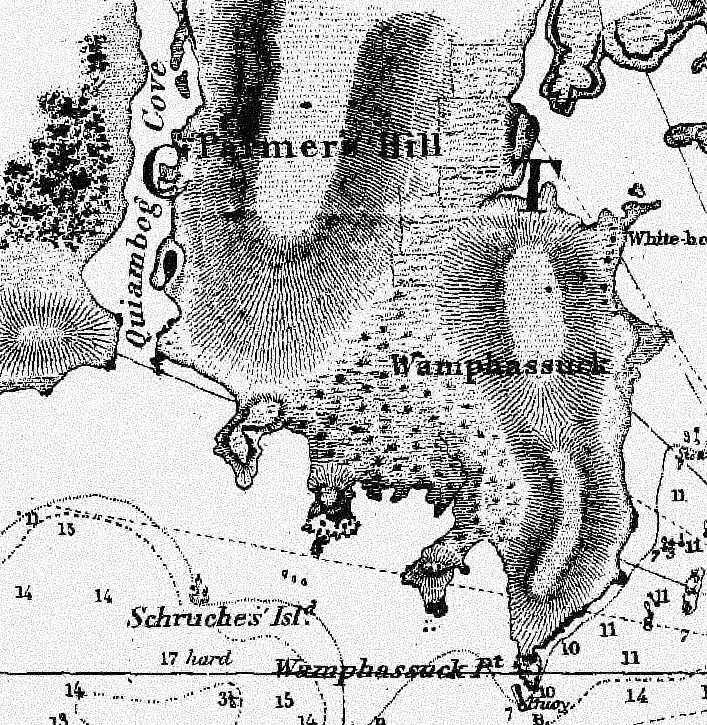 "Wamphassuc" may have gathered its current association with the point to the east of Lord's Point when Stonington Borough was settled in 1753 - residents there might naturally have attached the name for the entire point to that part they could see. In 1600 Amos Richardson gave the land consisting of Lord's Point and Wamphassuc Point to his son, the Rev. John Richardson. 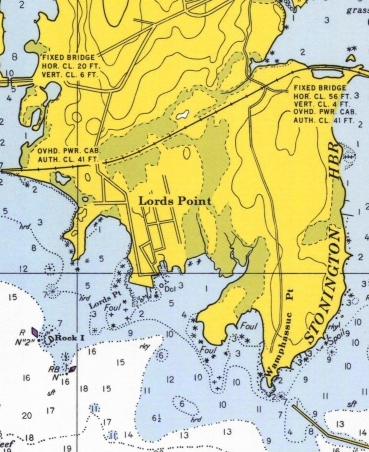 Lord's Point was referred to as "Cedar Point"; this seems to have referred specifically to that small point which Quarry Path is on, though it may have been used for the bulk of Lord's Point as well. An 1847 chart shows no names attached to the area (other than Wamphassuck, which already seems to be associated with eastern side of the area. A minor mystery is the name "Schruches' Island" for what we now term Rock Island. 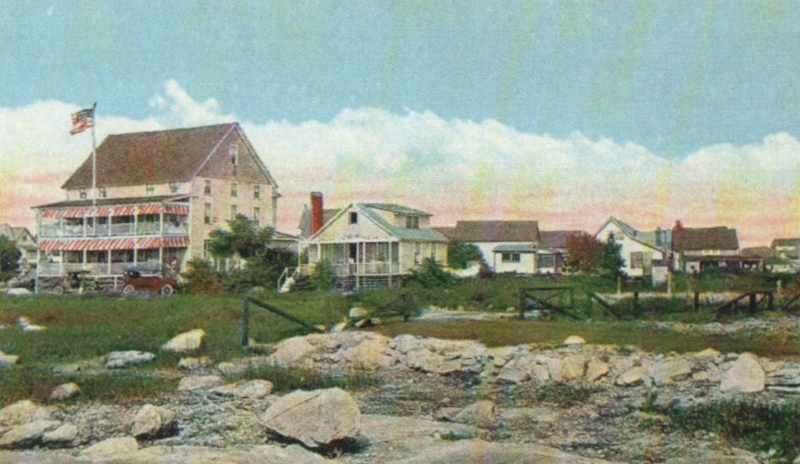 The "White house" (incompletely) labeled on the Stonington Harbor side is the Hallam House (still standing). 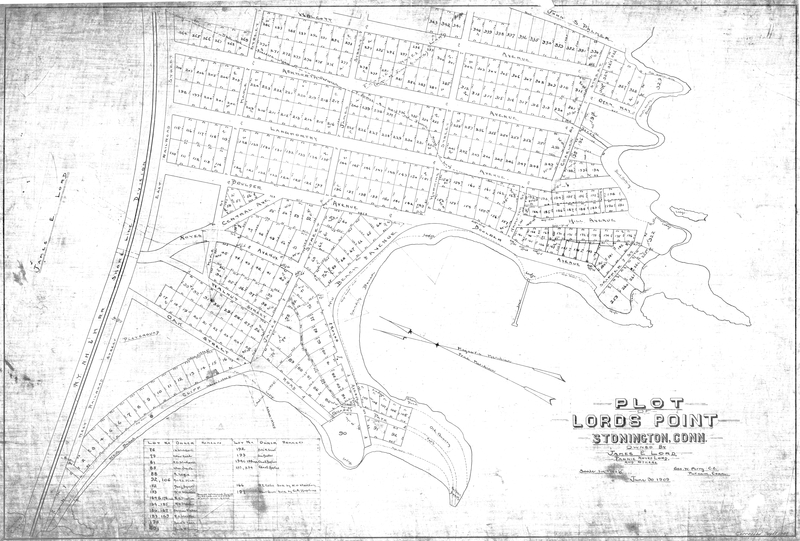 Lord's Point is now a separate, well-defined community, which owes its existence to James Eveleigh Lord, son of James A. Lord. Emeline Lord Babbett of Taunton, Mrs. G. Silva of Stonington (these entries are ambiguous). James E. Lord was born at Lantern Hill where his grandfather, John Lord, was superintendent of the Hyde Woolen Mills. [This would that James A. was not James E.'s father, but his grandfather]. James moved to the Road District in 1870, and took care of the poultry on his father's farm. In 1873 he went to Massachusetts to school for 7 years; he then was an auditor for the N.Y, N.H., & H railroad. 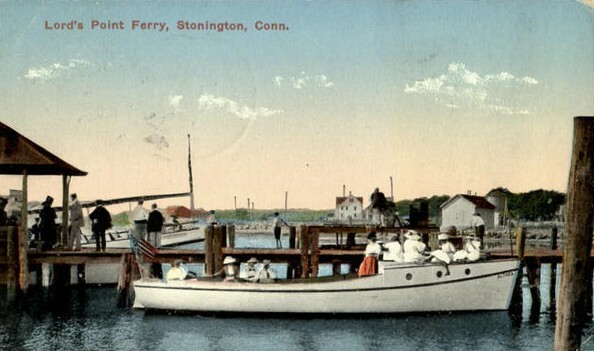 He returned to Stonington when his health failed. He lived at the Town Farm with his grandfather, Hill, who ran it. There he renewed his interest in animals, particularly poultry. In 1892 he purchased the farm & property at Lord's Hill and Lord's Point. He started raising Shropshire sheep and soon had a prize flock, winning first prize at St. Louis against all comers. Later he started raising turkeys, and had a prize flock of these, one, "Dan Amos", a 46 lb champion at the Boston Poultry Show. He has cut up Lord's Point into lots and sold many of these, and about 25 families, mostly of Springfield Mass have summer cottages there. Also from the Mirror of January 10, 1910 we have that he shipped 20 mammoth bronze turkeys to the Boston Poultry Show, winning all blue and special ribbons - 24 in all. He'd received 91 ribbons in 7 years of exhibiting. James Eveleigh Lord purchased his home on Lord's Hill and raised turkeys, sheep, and other animals. He bought the land in March 1892 from Samuel C. Langworthy21, page 126. "... and up from the cove was Lord's Hill, littered with more rocks and boulders per acre than any other land for miles around. As a Quiambauger would tell it, it took a lot of rocks to make New England, and the good Lord got together all he could, so he'd be sure he'd have enough. When he got through he had a lot left and dumped them on Lord's Hill. That's how it got its name." This sounds like a post-hoc poetic description; I haven't been able to find any real mention of Lord's Hill before James Lord purchased it. On an 1868 map the area is labeled "Darling Hill"; I haven't been able to trace that name's origin. In the 1847 chart above the larger hill (on which Montauk Avenue runs) is called "Palmer Hill". The Langworthy family itself has an interesting history, which will be dealt with in the main QB pages. I would strongly recommend the book "Murder at Darling Hill" by Judith duPont, published by the Stonington Historical Society - it not only provides excellent background, but it's also quite a mystery. In 1900, Lord's Point was entirely devoted to the grazing to [sic] Mr. Lord's shropshire sheep. 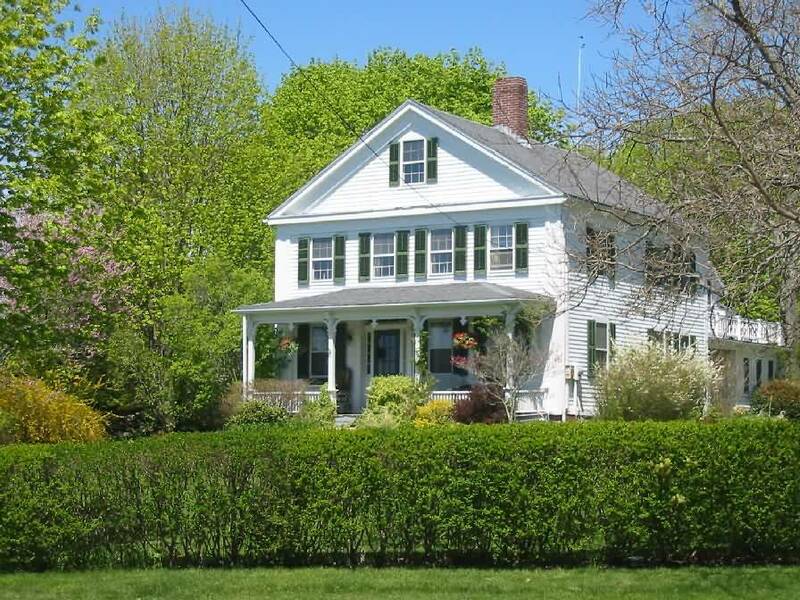 There stood a sturdy red clapboard sheep shed at 15 Hill Ave. There was also one tree on the other point. Mr. Lord eventually, with many restrictions, divided the entire point into "Lots for Sale". In 1918, his sheep shed was sold to Mr. DeVaze. The building was so strong, it was used as a base for his 2 story summer bungalow. His wife, Chlotilde DeVeze [sic? ], was a metropolitan opera singer. When she died in 1930, he couldn't bear to be in the house without her. It was sold lock, stock, and barrel to my parents, the Albrechts. Many a summer was spent here. My mom sold the cottage to my husband, Louis, in 1950. We remodeled it to be a year-round home. Under the wainscoating stood the red clapboard barn, sturdy as ever. Would your bank vie me a loan of $500.00 for six months? Mrs. Lord indorsing [sic]. You remember last year at this time the $2000.00 note. I was able to pay it within four months and within five moths sI also had the money to pay $2000.00 on mortgate now to Mrs. Danforthe. All this inconsequence [hard to read] from my business. Last season we sold over $4000.00 in building lots representing about 1 1/2 acre of land. These are now remaining on Lord's Point 40 shore lots which we sell at $500. each and several hundred in-shore worth from $200 to $400 00. I will appreciate this amount to bridge me [can't make out] a little and would place it in deposit. Sec. 11. 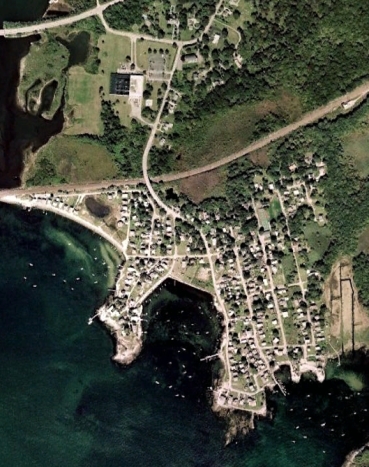 There is willed and devised to Lord's Point Association Inc. the shore from Beach Avenue to Skipper Street, to be controlled and managed by the Trustees of the Athletic Grounds and their successors and assigns, the two large Boulders must not be disturbed under penalty of forfeiture of the real estate to the heirs of the donors. It now can be difficult to keep clear exactly what "Lord's Point" is - it's most common modern use is for the legal entity south of the railroad tracks. However, it also has been used for the Lord's Hill/Point geographical region, so this history includes some of the elements that exist north of the tracks. and the downstairs veranda is largely enclosed. Much of the following is from Carol Kimball's book Historic Glimpses. Capt. James H. Sistare ("Captain Jimmie") was a fisherman from Noank. 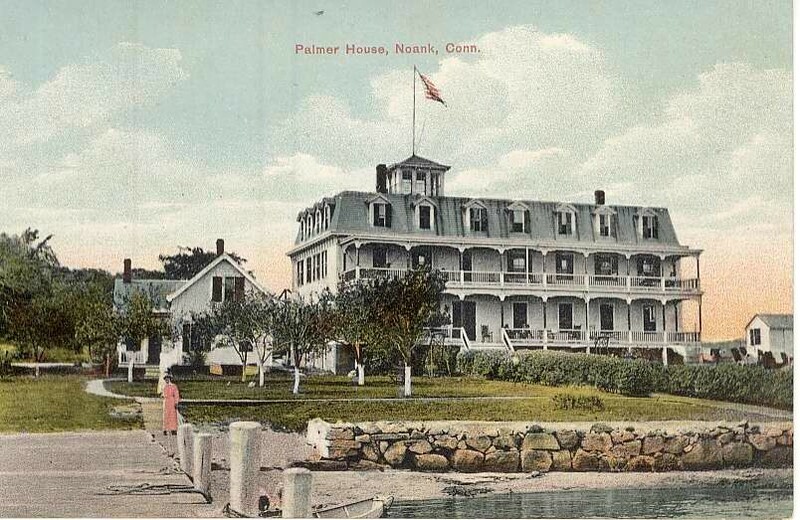 He was well known for his chowder, and opened a Noank hotel, the Palmer House, in 19004. He ran it for fifteen years, and sold it, with the intention of building a newer and better inn, on Lord's Hill. The Day (January 11, 1917) said that the plans included 21 rooms, and office, and a huge 40 by 24 foot dining room. The general contractor was F. E. Barlow, of Noank, and the foundations were done by George H. McDonald, also of Noank. A special feature of the inn was the veranda, 10 feet wide, which provided a nice view. ..The 3rd floor attic had 2 bedrooms on each end for the help. Trunks were in the center of the attic. My friend, Aletta Wilson Falt lived at the inn, and we played in the attic on rainy days: jacks, checkers, and dolls. The most fascinating part of Capt. Jimmy's Inn was the Captain himself. He was a tough and generous man who weighed 260 lbs. He had arms like a ham and hands like boxing gloves. He could do cartwheels on the beach when he was 40 years old. He descended from a Spanish family of rank out of Barcelona. His ancestor was Don Gabriel Sistare. Let's jump back a few generations to his grandfather who arrived in New London in 1772. He married Elizabeth Beebe whose family had come to America in 1630. James' father, Joseph, was born in 1794 in New London. He was a master mariner. They had 5 children including James born in 1860. Captain James Sistare began his sefaring career at the age of 7 when he shipped aboard "White Cloud" as cabin boy for 5 years. The next five years he shipped with his uncle who was 2nd mate. Afterward, he worked out of Noank on the "Althea", "Osprey", "Franklin", "Comet", and "Jennie". He built 3 boats himself: "Edith", "Edith II", and "AUnt Edie". His friends complimented him so much on his cooking that he decided tobuild a new summer hotel on Noank's waterfront and dock his schooner "Aunt Edie" next to it. He called it Palmer Hotel. It had all the newest assets: electric lights, steam heat, sea wall, and bath houses. He ran it for 15 years. Automobiles were on Route 1, so he sold Palmer Hotel (later burned) and build his new inn on Lord's Hill. He was a friend of Mr. Lord who didn't tolerate drinking. This was fine with the newly converted sailor. He had met the great Preacher, Moody, who traveled the country helping people "see the Light". The Camptain died in 1923 and was remembered for his temperance and charity. He was a mason and odd fellow. His new wife and Aletta's mother ran the htoel and sold it about 1936 to Thomas Hardy. It was an inn until Miss Kellems convert it to apartments." 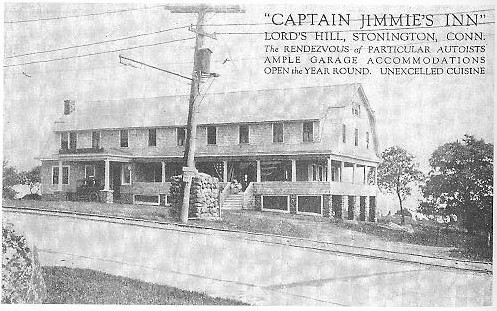 Captain Jimmie's Inn opened in the summer of 1917 and became quite popular; he was famous for his chowders. Captain Jimmie himself died at the inn on May 17, 1923, 61 years old. His funeral was held at his home, the inn. It became known as White Sails Inn, and for a time was apartments; then it was renovated, either to be apartments or condominiums. As a member of the Quiambaug Fire Department I went to one call there, when a fire broke out in a lower-level room which would be at the right end of the building as pictured to the right; the damage was minimal. It is at latitude 41°20'29.41"N, longitude 71°55'50.44"W.
1892 - James E. Lord purchased Lord's Hill and Lord's Pt., cut up the latter into building lots. In 1898, the point was referred to as Boulder Point becauses of the two large rocks on Boulder Avenue (which was initially called Point Drive). 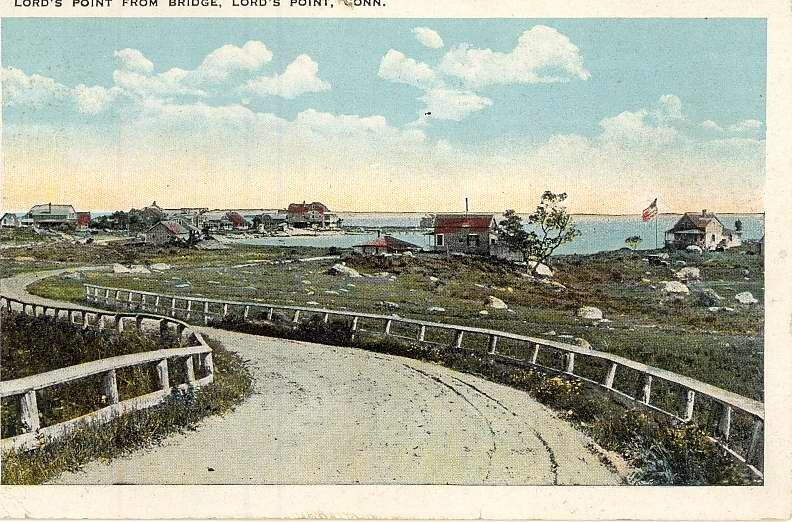 On January 11, 1909 the point was officially named "Lord's Point" by Jerome S. Anderson Jr., editor of the Mirror, for the benefit of the Post Office Department. Feb 1 1928 - Fire at Lord's Pt. burned inn and 5 houses. August 22, 1931 - Lord's Point Community House opened; according to the Mirror of August 21, 1931 the property was donated by James Lord, the building was done by point residents. 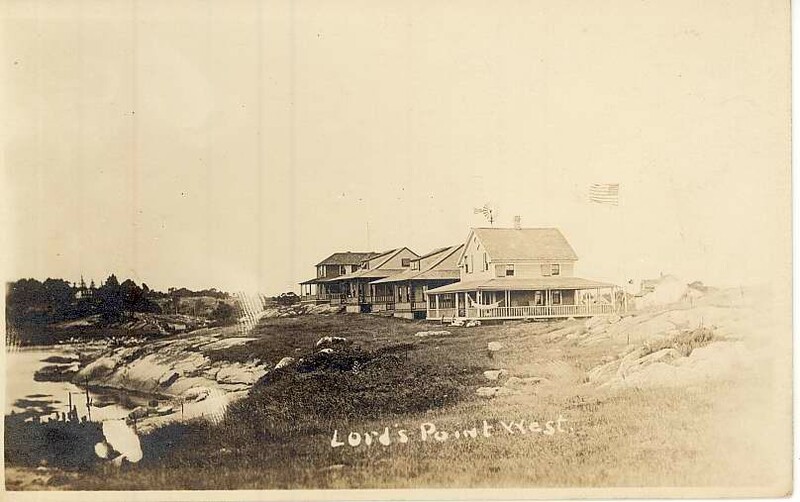 In 1926 the Executive Committee, meeing in Mrs. W. John (of Pennsylvania)'s house, moved to sponsor a dance to be held at the Lord's Point Inn (Stanton's Inn) to start a fund for the Community House. This began a search for where to put it. In 1927 and 1928 the main contenders were the "Whaleback" and two lots on Boulder Avenue, owned by Mr. Woodhall and Mr. Langster. The committee approached Mrs. James Lord about the Whaleback; sh was asking $4,000 and offered the land for $500 per year with interest - this was thought to be too high, but some foresaw the extension of a dock from there, to replace Langworthy's short dock. Due to the price this option was not considered further. The lots on Boulder Ave. were available for $1,200, but local property owners objected. By July 18 it was decided to put the building on the athletic field which Mr. Lord had given the Association. $3,000 was borrowed from the Pawcatuck Bank and Trust Co., and the Women's Club offered to raise money as well, by sponsoring bridge parties, cake sales, teas, suppers, white elephant sales, bingo, etc. A contractor was hired, and on August 21, 1931 the first meeting of the Association was held in the new Community House; this was a great event, as the Inn had burned to the ground in 1928 (the only other place for meetings was Vito's garage). After the Community House opened, it was voted that the Women's Club would have complete charge of operating it; that organization continued to raise funds to equip it and pay off the mortgage. Six years after the House was authorized, August 31, 1937, the $3,000 mortgage was burned. The Women's Club turned over responsibilities for maintaining and running the building to the Association in 1962. 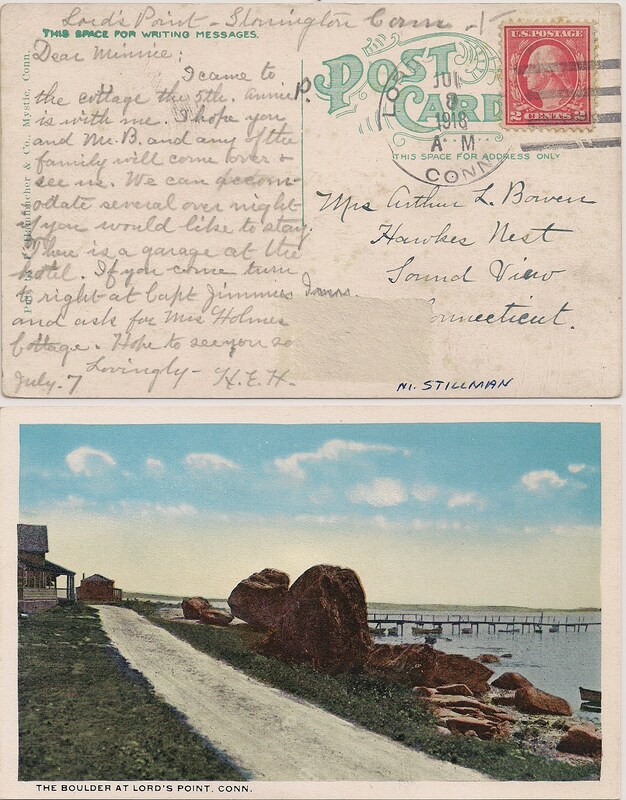 Below is a postcard sent by Helen Holm; the postmark, a bit difficult to make out, is "Lord's Point"; the date is July 8, 1918. In the text of the card she notes that "There is a garage at the hotel". She mentions Capt. Jimmie's Inn as one of the landmarks en route. July 14, 1934: Charles P. Potter established retail food store at Lord's Pt. Looking back towards the bridge from the point at the end of Quarry Path. Near Martin's house, old grinding stone. Known as Cedar Point originally. Dorothy Comingore, the actress who played the role of Susan Alexander in Citizen Kane, lived on the point from 1957 until her death in 1971. Potter store until 1950 - sold to John Crow, mailman.